When I was a child my mom always worked really hard to make my birthday parties memorable. We would have all the kids from my class over, usually to our large back yard, and we would all play for hours. She could come up with so many creative things for us to do in an age before Pinterest or Google. I don’t know how she did it. Thankfully I have a few more resources on hand than she did and I can look up all kinds of cool ideas for my children’s parties. However I still think that the classic birthday party games for kids are the best. They take very little money or time to set up and kids really seem to enjoy them. After all, they became classics for a reason. Here are some great party games for kids I enjoyed as a child and that my children have enjoyed also. Hot potato – This classic birthday party game is one still loved by kids. Take a bean bag, a ball or even a potato and have the kids form a circle. Then play the music. The kids have to pass the potato around the circle until the music stops. Then whoever has the potato is out. They sit down and the circle grows smaller until there are only two left. The last one standing is the winner. For older kids you can make it harder by spreading them out where they have to throw the potato to one another. The faster the music the faster they have to pass it, so pump up the tunes and get going! Musical chairs – Another variation on this party game for kids is musical chairs. You do not have to have chairs; you can use pillows or even towels as markers for the kids to sit down on. The children form a circle around the chairs (one short of the number of children). The music starts and they walk around the chairs. Then when the music stops they all try to sit down. Whoever does not have a chair is out. Remove a chair and start over until there is only one child who is the winner. Relay races – A great way to get kids active and calmed down after their cake sugar high, relay races are fun birthday party games for kids that require no setup. All you need to do is tell the kids to race between two trees or other objects. The first one to make it there and back is the winner! You can create an obstacle course effect by adding in crawling tubes, tire jumps, rope climbs and so on depending on how much room you have to work with. You can also do a three legged race or a sack race if you choose. I remember trying to do a wheelbarrow race and my arms just were not up to the task, but that is another great way to get kids active and playing. Simon says – This is another party game that can be as active as you have room for. If an adult is the caller then you can do things like say “Simon says do three jumping jacks” or “Simon says touch your toes” to make the kids really get a workout and burn off some energy. Kids love this game and the last child not to slip up is the winner! As we got older I remember my mom would call out the direction faster and faster until we were all panting to keep up. We sure made a lot of mistakes then and were quick to rat each other out! Red light, green light – Like tag only with more effort, this party game for kids is a hit for parents because it prevents rough housing. All the children try to catch the person who is it, but the person who is it can call out red light at any time and the other children have to freeze. This means they can’t run because if they move after the red light is called they are out. The first person to touch “it” becomes the next it. We always had a lot of laughs seeing the strange positions we froze into. Scavenger hunts – I remember having a lot of fun with scavenger hunts as a child. It is a great learning experience also. You can do general things like “find a green object, a blue object and a yellow object” or you can do harder things for older kids like riddles they have to solve to figure out what they need to get. Something like: “bring something that has hands but no arms and runs without feet”. A watch, of course! You can even make it into a treasure hunt where they have to gather the clues to find their prize (gift bags). My mother did a treasure hunt with Bible verses one time. I can only imagine how much work that took to come up with all those fun scavenger hunt ideas but it was a great way to share the Word with all those kids from school. 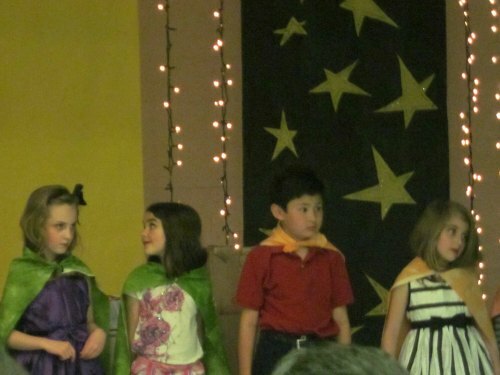 Dress up – All kids love to dress up. Depending on what kind of kids you have you can offer things like superhero costumes (towel capes and paper masks), princess costumes (dollar store tutus and crowns), cowboy gear (straw hats and bandanas), or animal costumes (headbands with ears and pin on tails). All you need for a dressing room is a big refrigerator box and a cut out door. Turn a smaller box into a costume chest and let the kids have fun picking out their own outfits for the party. Getting artistic – Face painting, puppet making and jewelry making are only a few of the arts and crafts you can do with kids at a party. For older kids you can offer up a bunch of beads and they can make their own take home gifts like bracelets and necklaces. For younger ones you can have them decorate paper lunch bags to make puppets and put on a puppet show. Face painting is a hit with kids of all ages, but some of them are allergic so be careful. You can even incorporate the treats into the arts and crafts. I love the idea of decorating your own cupcake or bowl of ice cream with a variety of colorful candies, sprinkles and fruits. Monster shootouts – If your party is outside in the summer then you want to find ways to beat the heat. A monster shootout can be just the thing. Combing art with fun, have the kids draw monsters and cut them out of the paper. Then use a triangle of paper and glue it to the cutout to hold it upright. Hand out squirt guns or Nerf guns and let them shoot it out with their monsters. Another variation is to let kids do water gun paintings to bring home. You can also do a live shootout with laser tag games or Nerf battles. Water balloon toss – Another wet and wild game is water balloon catch. Have the kids line up across from each other about ten feet away. Then they toss water balloons back and forth. Every time they catch it without it breaking they move back a step. The team that gets furthest apart without breaking their balloon is the winner. Of course once the game is over they will all want to get wet, so hand out water balloons and watch the fun! You will probably want to wait until the end of the party to do this game! 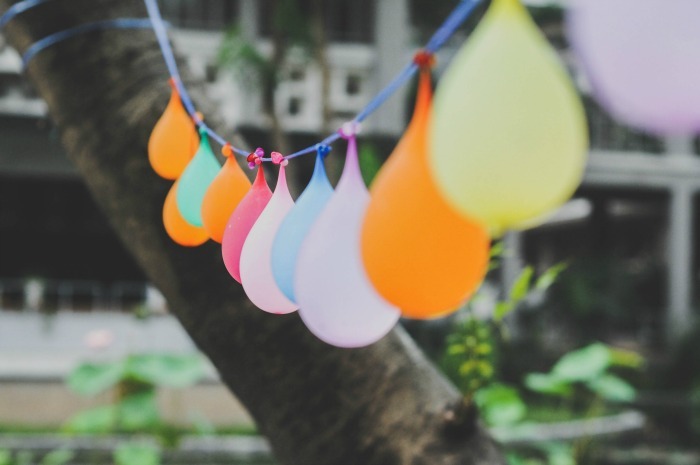 You can even string up water balloons and let them take turns trying to pop them without getting wet. 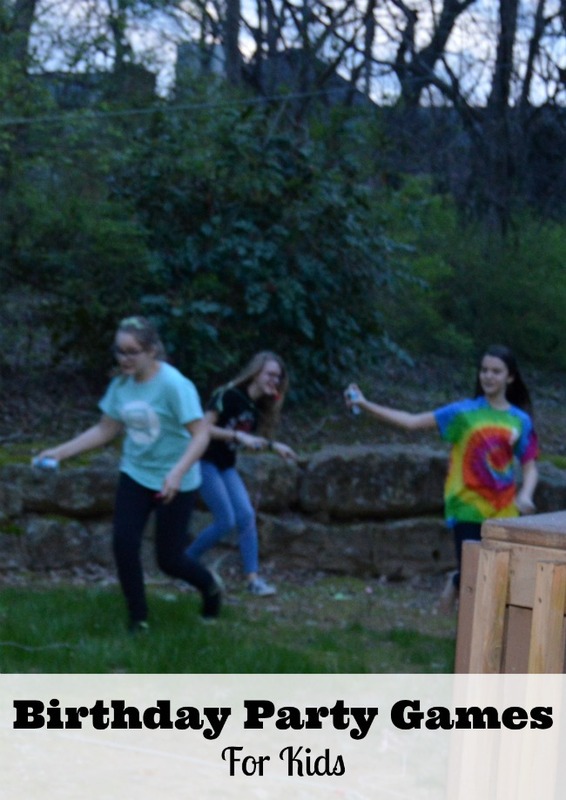 Bonus party game idea: Just give them some silly string and let them run wild outside! These are just a few of the classic birthday party games for kids that my mother came up with when we were young. I can’t believe how creative she was and how much we all enjoyed her games. We never had a lot of money growing up but we never missed out on anything. You can give your children a frugal birthday party to remember with the most basic games and they will still have a blast. Great list, Rachel! I played many of those when I was younger as well, and Scavenger Hunts were one of my favorites! A great item to find would be a “Sock that has a hole in it.” Kids always run around looking for a sock that has a hole in it, while they don’t realize that every sock does. It’s fun!